Another ‘super Saturday’ saw the Nomads at home to Milford United on Saturday 26th Sept. And another decent crowd witnessed another win in the First Division for the homesters. The ‘Ronins’ played some good football and proved difficult to break down. Neyland had to wait for 25 minutes before the deadlock was broken. Awarded a free kick just inside the visitor’s half, centre back Nicky Koomen stepped up to float a ball into the visitor’s penalty area. However such was the accuracy and pace of the ball that it evaded both defenders and the Neyland strikers and floated over the keeper into the net giving the Nomads a one goal lead at the interval. 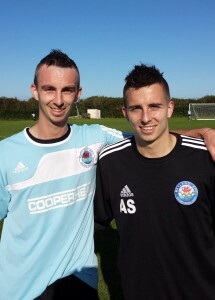 Scorers Nicky Koomen (left) and Justin Harding (wearing Andrew Smith’s top). There was almost a ‘repeat performance’ in the second period when supporters had to wait for almost half an hour before Neyland made the game safe. Justin Harding latched on to the ball left of the goal, beat a defender and neatly turned and swept the ball into the net for the Nomad’s second. So the 2 – 0 victory moved the team up to 4 th in the first division. Team: Patrick Hannon, Scott Jones, Paul Hannon, Nicky Koomen, Sean Hannon, Nathan Warlow, Gary Power, Henry Durrant, Mikey Chandler, Justin Harding, Aaron McQuillan, Andrew Smith, Niall Day. This entry was posted in Sports on October 8, 2015 by admin.